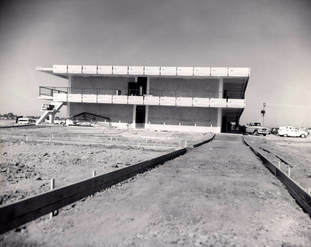 Bourgade Catholic opened its doors in 1962 to students who were taught by the Marist Priests and Brothers, the Sisters of the Institute of the Blessed Virgin Mary, sisters from the Congregation of the Humility of Mary, and several lay educators. In 1972, the Holy Cross Community of Priests from the University of Notre Dame assumed the administration of the school. From 1988 to 2011, the principal of Bourgade Catholic was a member of the community of the School Sisters of Notre Dame. In June 2018, the school assumed leadership under Mr. Javier Bravo, who believes in bringing joy to the campus of Bourgade Catholic, whilst pursuing the mission of educating and forming the entire student. Education at Bourgade Catholic High School fosters the spiritual, intellectual, moral, social, creative, and physical development of the total person. Informed by faith and the Catholic tradition, we are committed to providing a rigorous academic program that prepares students of all learning styles for college. Supporting families as the primary educators of the student, we continue the development of spiritually centered lifelong learners, who are academically prepared, effective communicators, and citizens of a global world. As educators and ministers, we promote a vision of life that respects individuals, appreciates cultural differences, and gives witness to faith beyond the school setting. 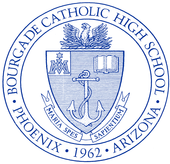 Bourgade Catholic High School strives to be a student-centered learning community where each unique individual is welcomed and encouraged to grow in his or her relationship with God, others, and a constantly changing world. Bourgade Catholic is named after the Most Reverend Archbishop Peter Bourgade. Peter Bourgade was born in Puy-de-Dome, France, on October 18th, 1845. As a French missionary priest he was sent overseas in 1869 for service in the New Mexico-Arizona Territories. Each day's work was long and exhausting. Travel was difficult and the people were often rowdy and disrespectful. Despite the harsh conditions, Fr. Bourgade quickly adapted to his new home. On May 8, 1897, Pope Leo XIII created the new Diocese of Tucson, and Peter Bourgade was appointed its first bishop. His zeal in providing for strong religious education programs for the young resulted in the establishment of twelve schools and orphanages. In 1899, Bishop Bourgade was appointed Archbishop of Santa Fe, New Mexico. He oversaw the activities of several dioceses, including Tucson, and supervised the continued growth of the Church in the Southwest. 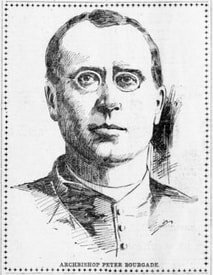 On May 17, 1908, Archbishop Bourgade died of heart failure and was laid to rest under the high altar of the Cathedral of St. Francis of Assisi, in Santa Fe, New Mexico.